Saturn's Magnetosphere - Universe Galaxies And Stars Section. Scientists from the Los Alamos Laboratory are beginning to study the data returned by from the Cassini plasma Spectrometer (CAPS); an instrument on board the spacecraft designed to measure the space environment around the Ringed Planet. During its first pass over the rings, the instrument turned up low energy plasma which seems to be trapped on the magnetic field lines between Saturn's Cassini Division, the gap between the planet's A and B rings. 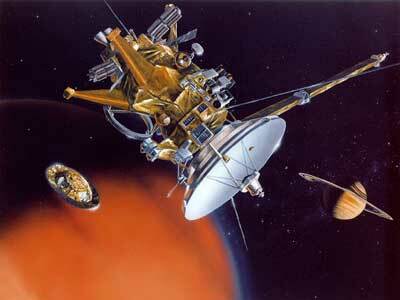 Cassini will have another 70 orbits around Saturn so the team will have many more opportunities to make discoveries. University of California scientists working at Los Alamos National Laboratory have begun to analyze data from an instrument aboard the joint U.S.-European spacecraft Cassini. Although Cassini has only been orbiting the planet Saturn since July 1, data from the Cassini plasma Spectrometer (CAPS) has already begun to provide new information about the curious nature of Saturn's space environment. CAPS had been detecting advance readings for several days before Cassini finally crossed the bow shock that exists in the solar wind ahead of the magnetosphere, a huge magnetic field bubble produced in the solar wind by Saturn's strong magnetic field. On June 28, the spacecraft entered into the magnetosphere itself and began taking data. From this very preliminary set of measurements, it is apparent that the outer reaches of Saturn's magnetosphere are probably populated by plasma captured from the solar wind, but closer to the planet the plasma comes primarily from the rings and/or the inner icy satellites. According to Michelle Thomsen, the current Los Alamos CAPS project leader, "After many years of design, development and testing, and then the seven-year journey across the solar system, CAPS is finally doing the job it was built to do. We are quickly learning much, but I think we have only begun to understand what CAPS can teach us about Saturn and its space environment over the next few years." CAPS consists of three separate analyzers designed to measure the electrically charged particles trapped within Saturn's magnetosphere. Los Alamos played a major role in the design and construction of two of them: an ion mass spectrometer (IMS), which incorporates a novel design developed at Los Alamos to identify the different atomic species in Saturn's magnetospheric plasma, and an ion beam spectrometer (IBS), which is based on a design used by Los Alamos scientists on several previous solar wind research missions. During Cassini's first brief pass over Saturn's rings, CAPS identified a previously unknown low-energy plasma trapped on the magnetic field lines threading the Cassini Division, the name given to the gap between the main A and B rings. With the four-year mission just beginning, including more than 70 orbits of the planet, CAPS is poised to provide scientists with a new level of understanding about Saturn's space environment, as well as clues about some of the space physics processes that operate more universally in the solar system. The CAPS team involves scientists and engineers from 14 institutions and six countries, including Dave Young, the Principal CAPS Investigator at the Southwest Research Institute in San Antonio, Texas. At Los Alamos, the CAPS effort was made possible by the work of numerous members of International, Space and Response Division and its predecessor organizations. The IMS was designed by Los Alamos staff member Beth Nordholt and former staff member Dave McComas. In addition to Thomsen, current members of the team include Bruce Barraclough (lead investigator for the IBS), Dot Delapp, Jack Gosling, Dan Reisenfeld, John Steinberg, Bob Tokar and summer student Brian Fish.